Penn High’s No. 1-ranked Girls Soccer team made senior night a success as the Kingsmen defeated Glenn, 6-0, on Thursday, Sept. 29. Brooke VanDyck earned an assist on Penn’s sixth goal, giving her 14 assists for the season, which ties the school record. VanDyck also scored a goal. Kristina Lynch scored a goal, which gives the Florida State recruit 26 goals this season. The school record for most goals in a season is 28. Tori Varga contributed one goal and two assists. Sommer Domal, Lexi Marks and Kaitlin Paul combined for the shutout in goal. Penn’s victory finished off a perfect Northern Indiana Conference season with a 10-0 record. The No. 1-ranked Kingsmen are 15-0-1. Penn also posted its second consecutive undefeated regular season. The Kingsmen are 36-1-3 combined for the 2015 and 2016 seasons. 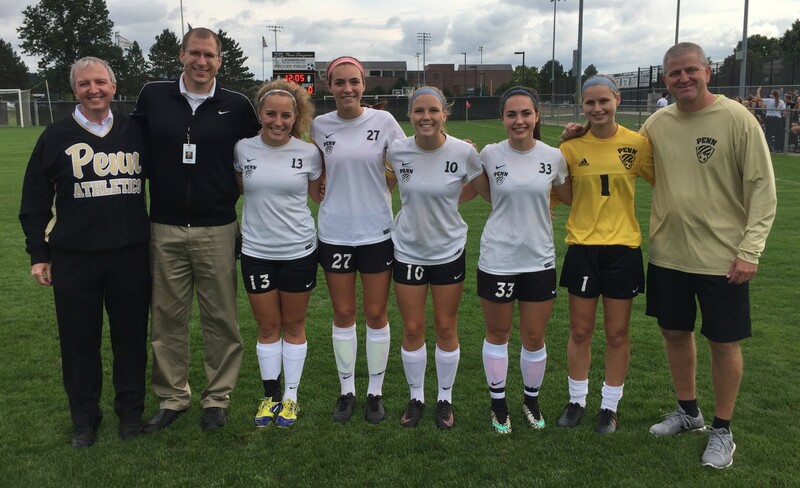 Penn Girls Soccer coach Jeff Hart appreciated the contributions of his seniors, Nicole Knudtson, Tori Varga, Lexi Marks, Savannah Day and Sommer Domal.